Reminder: There is just a little less than week left to enter my Holiday Giveaway! As I mentioned yesterday I had difficulty picking out Zoyas for my previous order. If you follow me on Twitter you may have noticed last week I was obsessively asking questions about which colors to get. 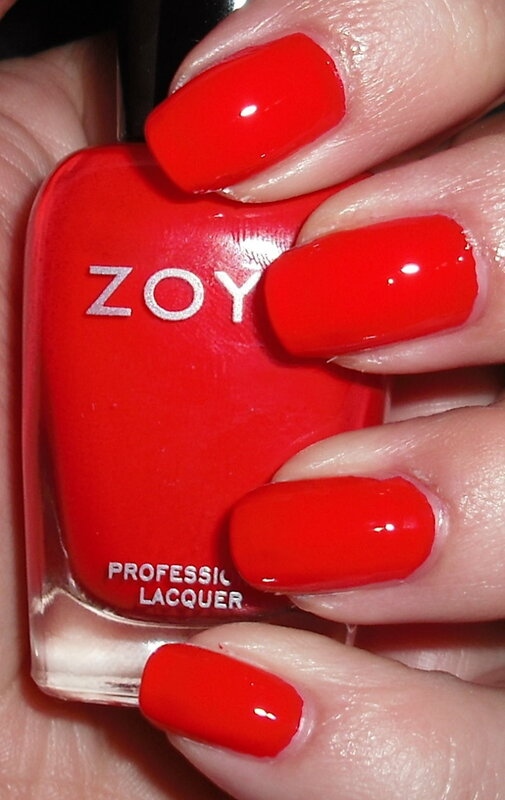 One of the more challenging decisions was between two Zoya red cremes Zoya America and Zoya Maura. There are swatches of this online, but every picture is different so it's hard to determine which one you want! This recent Zoya sale was also difficult because you didn't have the time to order the Zoya spoons to test out the colors. My biggest thing is I adore red polishes, but I don't want to get dupe of something I already have. I went back and forth between America and Maura for a few days and finally decided on Maura. I haven't seen comparison swatches of these side by side, so I'm not sure how different they are, but I got the impression Maura was a brighter more vibrant version of America. Maura is a bright warm tomato red creme. This is exactly what I was looking for! Maura is from the recent summer Flash collection. I have true red cremes, cool-toned red cremes, but I didn't have any warm-toned red cremes. This is a great vibrant red with a hint of orange to it. :) I'm wearing it now. It's probably to bright for fall, but I was getting kind of tired of the darker colors for the time being. I don't think you could have gone wrong either way, but America for some reason to me seems so summer. That is an amazing red! So bright!